Involvement in large scale projects for well-known structural engineering consultancies has formed the backbone of my experience, providing the opportunity to work with and to learn from leading engineers in the industry. I have been involved in a variety of stimulating projects which fall into a category that is the supreme visual representation of ‘the art of structural engineering’. Stadium structures, for example, demand long roof spans to allow spectators an uninterrupted view; spectator stands are prone to disconcerting, even dangerous, vibration. 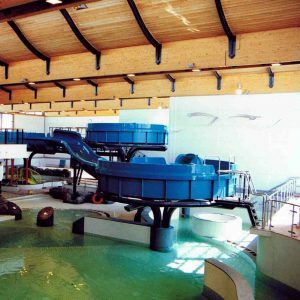 Swimming pools and leisure centres often have strongly visual structures in a damp, chlorinated environment and conversions of older buildings need to be reconfigured for contemporary use; all structures should be practical and ‘buildable’. These demands, and more, must be analysed and solutions negotiated with large design teams comprising: client bodies, project managers, general contractors and specialist subcontractors, architects, building control bodies and so on. 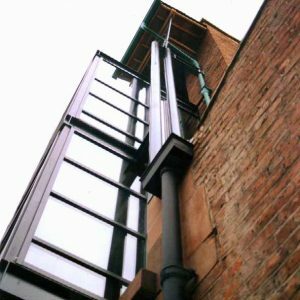 Only at the end of an exhaustive building process is it possible to build an exciting structural solution. An early career challenge. I was privileged to work with Brian Forster and Alistair Day (at Ove Arup Partners), who had pioneered the ‘dynamic relaxation’ method of analysis for tension fabric structures. 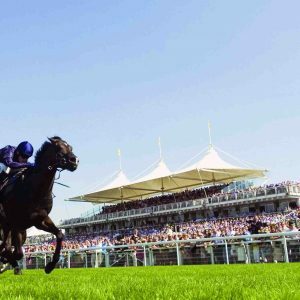 Involved with the design throughout, from analysis to drawing, to site attendance for the steel frame erection by Littlehampton Welding and the Bavarian fabric contractor, Koit High Tex – this was a challenging and rewarding experience. Completed circa 1991. 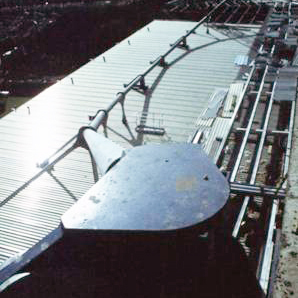 The project at Stamford Bridge involved the design of the roof and South stand plus a Hotel complex to the rear. The lightweight and innovative catenary roof solution is somewhat more economical than the cantilever roof form frequently adopted. The design was based on a concept by my employer, engineer Steve Morley, who has been instrumental in the design of many iconic stadia. Business incubation centre at Lancaster University. A prominent project with Faulkner Browns Architects featuring an 18m span cable stayed bridging structure in the entrance block. Trial and error design of the cables and bridge structure was involved to limit the distortions of the frame to allow fixing of curtain walling. A footbridge fully detailed to the entrance with a slim deck based on the king-post principle. 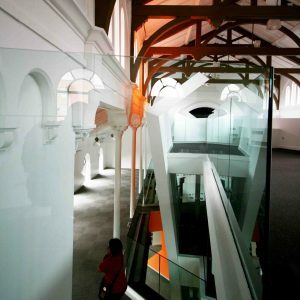 Refurbishment of a congregational chapel with Bluetree Estates as client and OMI architects. It is shortlisted for a RIBA Architectural Award. A novel ‘activity pool’ by Faulkner Browns Architects involving the design and detailing of pool structures, slide supports and glulam ‘S’ curve roof. 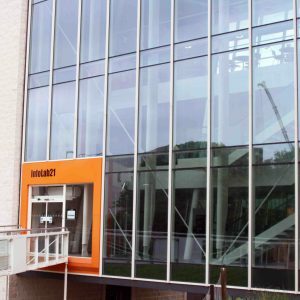 I later worked with the project architect, Andrew Kane, on the Infolab Project at Lancaster University. 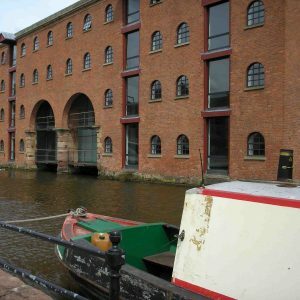 Conversion of Bass Warehouse in the Castlefield Conservation Area of Manchester into office use. I worked with Jim Ramsbottom who has achieved a life’s ambition to redevelop much of the previously derelict canal basin where the Rochdale Canal meets the Bridgewater Canal in Castlefield Manchester. This was the first phase reconstruction of a mid 19th century warehouse with OMI architects. Completed circa 1997. Reconstruction of a historic canalside warehouse built circa 1827, with barge access at ground floor, damaged by bombs in the second world war and by a more recent fire. Ian Simpson was commissioned by property developer Jim Ramsbottom to restore this building and convert it for modern office use. Two circulation cores were placed at the gable ends, in a contemporary style. Floors, mezzanine structures and roof repairs were all undertaken, prior to the second, fit out, stage. Completed circa 1995.